Exclusiveness, harmony and pleasure are three of the most popular trends in home design, increasingly the focus of contemporary aesthetics. These desires linked with the sensory and emotional aspects of the home translate into aesthetic solutions experimenting with new technologies, innovative ways of using materials and, in the most original projects, a new concept of space in the home. Architects often look to the past for new stimuli for design, coming up with attractive interior decorating and architectural solutions. This is the case of a recent residential project in the centre of Madrid, declaredly inspired by the experience and practicality of the Case Study Houses built in the US in the ’50s and ’60s. The Case Study Houses provided models of efficient economical housing such as the experimental projects in Europe in the first half of the twentieth century (such as Stuttgart’s Weissenhof district in 1927, designed by Ludwig Mies van der Rohe and implemented by Le Corbusier, Gropius, Stam, and others), particularly in the housing boom in California following the Second World War, when these prototype homes were designed to provide housing for thousands of soldiers coming back from the war. The new home in Madrid designed by architecture and interior design studio La Reina Obrera combines contemporary elements with vintage items. Natural materials such as wood stand side by side with Minimalist surfaces in a fully automated home. 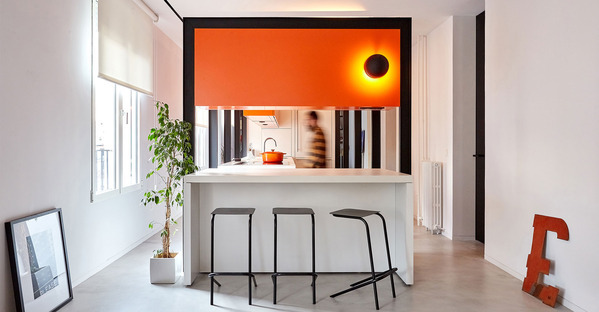 What stands out in this original housing concept is the clean volumes and simple shapes, the clear division between day and night areas, use of a few carefully selected materials, and use of contrasting colours such as orange, which the client specifically requested to give the home a strong sense of warmth and a bold identity. The studio’s project reflects a desire to use "items of simple design which do not compete with the architecture itself, but are integrated into it". One of the most distinctive spaces in the whole home is the kitchen, which features a Uni Ice countertop by SapienStone, the Iris Ceramica Group brand specialising in production of top-quality porcelain kitchen countertops, satisfying all the aesthetic and practical demands of today’s kitchens both large and small. Made of ceramic clays with colourfast colours, SapienStone countertops are a decorating accessory combining the exceptional aesthetic qualities of ceramic with outstanding performance taking advantage of the unique properties of porcelain. These include resistance, impermeability, hygiene and easy cleaning: a series of features that also make SapienStone surfaces ideal for outdoor spaces. In the home in Barrio Chamberí the architects chose the Uni Ice countertop for the purity of its white surface, without any veins, with a matt finish: a combination of aesthetic properties that blend into the work surface and perfectly suit the simplicity of the home’s design. The SapienStone countertop was made with "a work surface 5 cm thicker with the aim of visually aligning it with the height of the handles on the cupboards below". The solution reveals that the SapienStone kitchen countertop can be adapted and integrated into any kitchen counter, island or peninsula, adding uncommon versatility to its evident technical and aesthetic benefits.